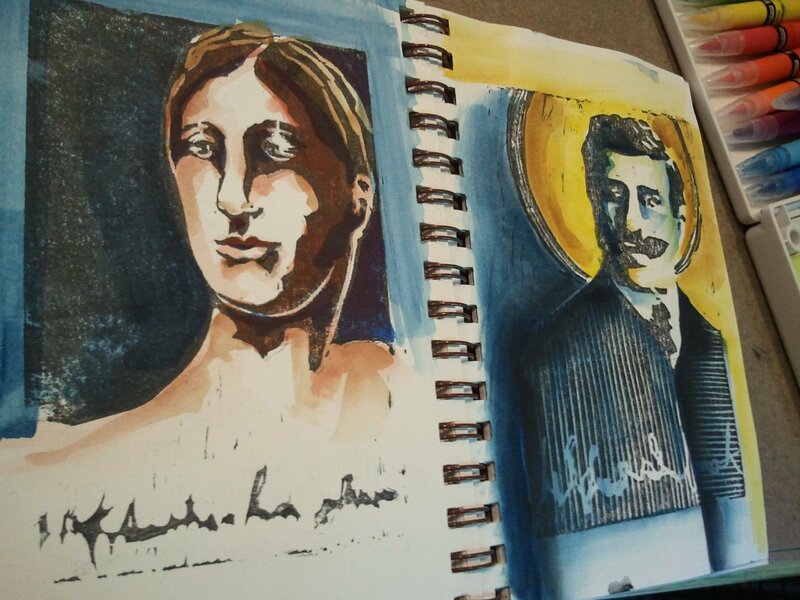 Reusing your own artwork in your journal pages helps you get the most out of the time you put into creating art. By making copies of previous journal pages and other art you’ve created, you continually have a great stash of collage fodder right at your fingertips! You are able to revisit your art in a totally new way and create pages that are uniquely your own. We will use black and white copies of work and other black and white journal fodder to create a color book style page that we will build on with paint, pens and water soluble crayon, completely reinventing the original work. Special collection of journal fodder you won’t be able to get anywhere else! We will create a mixed media background using a variety of techniques, developing a perfect 8×10 backdrop to add a mixed media portrait to. I will deconstruct the drawing of a face to make it doable by everyone. 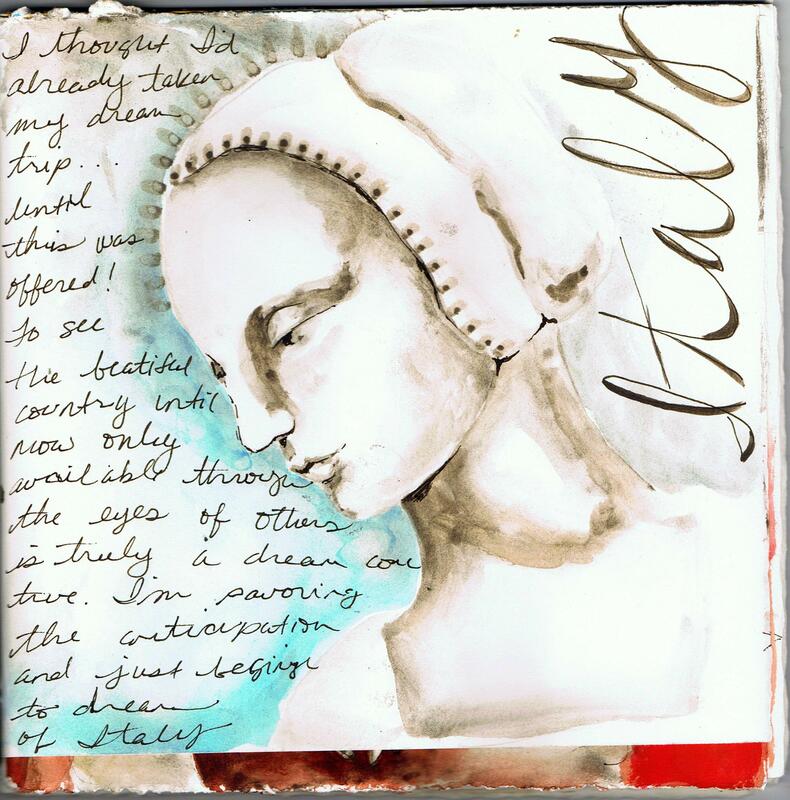 Behind the face we will explore ourselves, through journaling. Our ‘thoughts’ will then be covered up by the face we create as we work on a self portrait of sorts that anyone can do. I provide full support for all skill levels in this class, offering a variety of ways to add a face within your comfort zone. Now is the time to reserve your space at Danbury CT! I also just learned that Americana Tuscana has extended the early enrollment discount of US$100.00 until September 30, 2011!! So if you want to join me in Italy now is the time to sign up and save some $$$! Derivan Liquid Pencils are a relatively new medium that takes sketching to a whole new place! With different tints in both permanent and rewettable formulas, they offer a wide range of creativity and allow you to ‘sketch’ without picking up a pencil! I’ve been working with the creators of Liquid Pencil and am excited to have a line of new products coming out that make this new medium especially user friendly to Art Journalers. If you love the look of sketching but are unsure of your drawing skills, this class will give you exactly what you need to begin sketching in a journal made with hot press watercolor paper. For the more advanced student the sky’s the limit when you add this to what you already do and I will show you the many different techniques possible with this innovative product! I will be bringing my very own Portrait Sketch Stamps to use in class as well so there is nothing to fear if you don’t have much experience with portraits-you can literally stamp a sketch! As we gather memorabilia from our day trips, we will add them to the covers of our journals to finish off an artistic keepsake that will bring back the once in a lifetime memories of our time in Italy. We will spend the morning session constructing our sketch journals using a binding method from my book, with a twist-we’ll add a pocket or two to the book for the memorabilia we’ll no doubt pick up on our outings. I will introduce my line of Sketch Ink from Derivan Liquid Pencil and we will begin to explore its properties and the tools we will use to apply it. No pencils here! Derivan Liquid Pencil is actual graphite in a paint-like form. My line of Sketch Ink products provides a user-friendly way to apply this medium in a more liquid form. Using both Permanent and re-wettable formulas, we will smudge, erase, lift off, burnish it and more. Now that everyone has had a chance to play with the Sketch Ink, we will begin our first journal pages, discussing our views on what Art Journaling means to us and how we each find ways or hope to find ways, to incorporate it into our daily lives. This will become the foundation for our pages as we layer various fluid media. Time to venture outside for inspiration! Taking our journals, Sketching Ink and Brushes, we will begin quick sketching without pencils as we capture the sights and sounds around us. Time to find a quiet spot to turn yesterdays sketches into journal pages filled with words, color, and texture. We will now gesso the front and back cover of our journals turning them into leather like covers and then add our memorabilia in true mixed media collage form to create amazing covers for our journals. Fruit, vegetables, people, there will be no end of inspiration and a Quick Liquid Sketch can capture the moment so we can return to it later. Depending on how many pages you’ve already completed, it may be time to create a second journal. We will stroll outside and find lovely spots to capture the beauty around us and enjoy returning to the moments captured from the mornings outing. 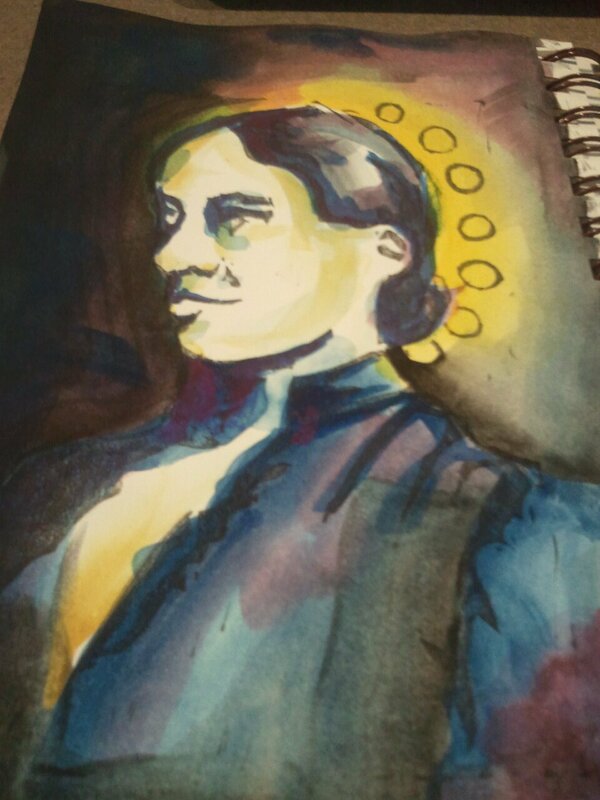 Adding portraits to our journals will be the finishing touch. I will provide a number of ways to accomplish this that will suite the varied degrees of experience. Even if you’ve never drawn a face before, I’ll show you how to use my Portrait Sketch Stamps to create a one of a kind face. These were designed to work with the Sketch Ink and you will be amazed at how you can personalize the stamped image to make it truly your own. Now is the time to share our journals within our small group. We are all friends now, having shared this once in a lifetime experience and as we talk about our art, finish up our pages, exchange email addresses and take pictures, we will know we’ve bonded in a special way through our journals and our art. We are moving! To Dallas! And every time I tape up a box my mind wonders to the many uses for packing tape that don’t have a thing to do with moving-lol! 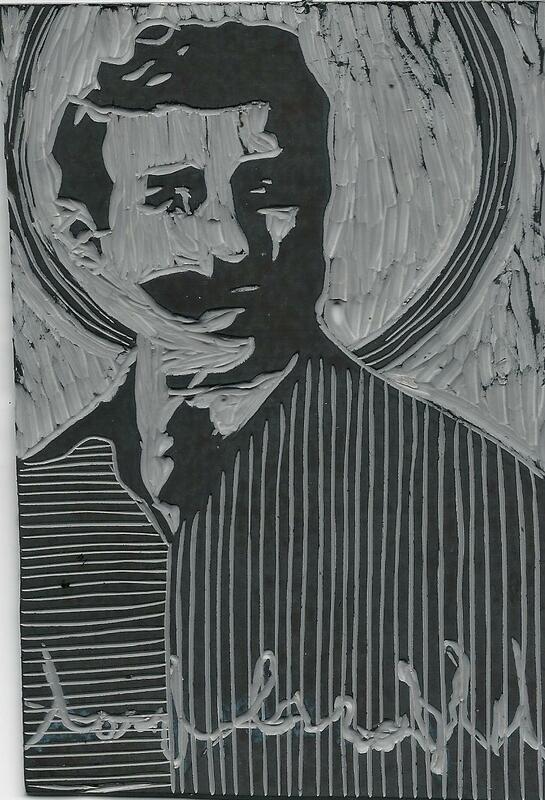 This ‘packing tape transfer’, is not nearly as fun as the crafty kind. We are excited though to transfer our family to a place where my DH (darling hubby) won’t have to fly a day-long commute to work. After 12 years of that kind of living arrangement we are happily walking into phase two of ‘See Nate Commute’, a 25 minute drive to the airport! 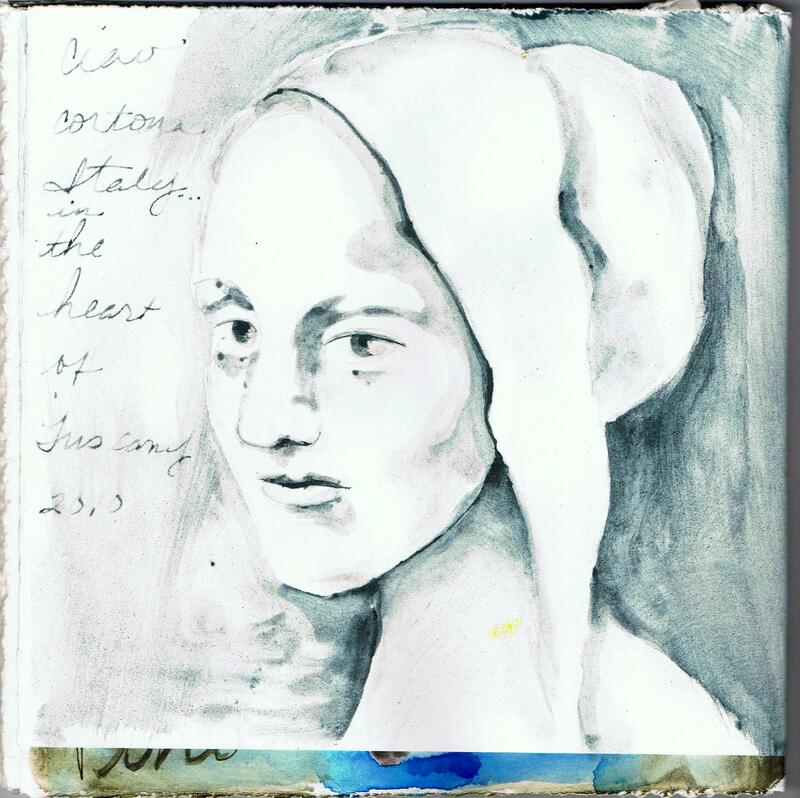 During our last trip, on the flight from Springfield to Chicago, I left my Art Journal on the plane. 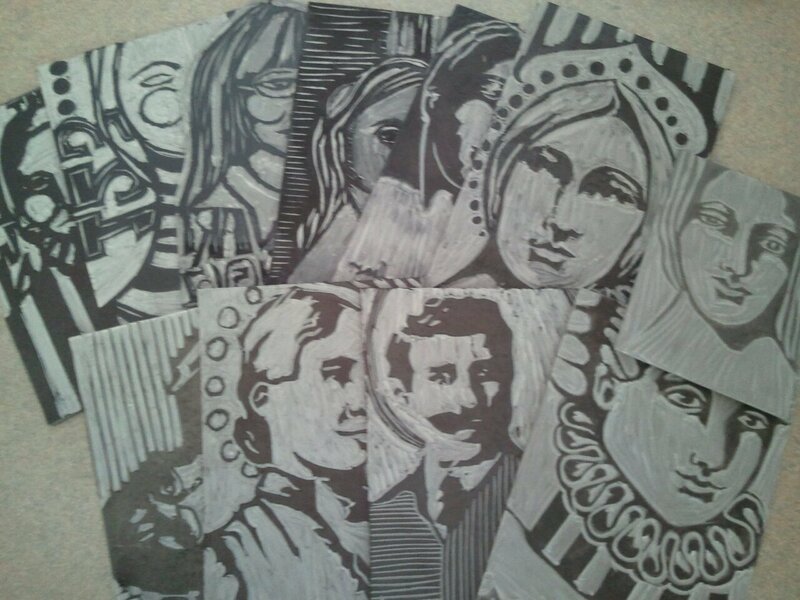 It was full of lino cut images that I was turning into journal pages. I had it about 3/4 full of almost done pages like these, just waiting for the finishing journaling and doodling. So if any of you see some of these faces ‘out there’ let me know! I’d so love to find this journal again. The one nice thing is that because these pages all started with my lino cuts, I can use the same images to begin new pages. I still have all my hand carved stamps and will begin again. Just like our move, where we will begin a new chapter in our lives. One we hope will bring us more family time with Nate home more often, less stress with him trying to commute a long distance to work, and with new opportunities for growth. It feels good to move somewhere where we already know some people and already have offers of help unloading on the other end of the move. This is one of those ‘trip of a lifetime’ events that requires some advance planning. It’s in the back of my mind as I work through the tasks of today, sitting there like a prize at the end of the race! 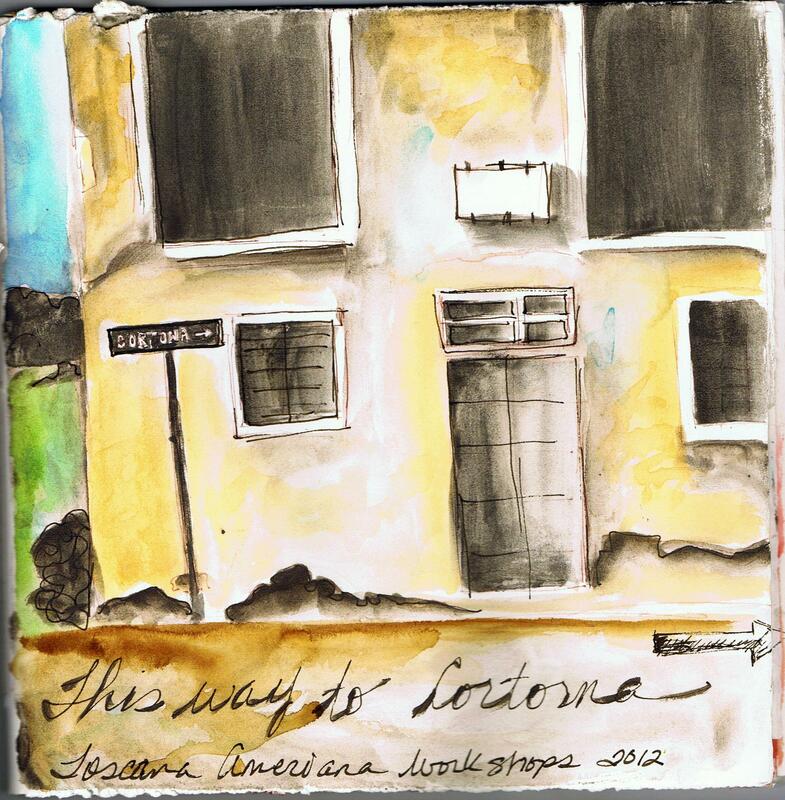 I’ve never been to Italy and going there to create art with a small group of artists is exciting beyond words! **Included with “Hotel” plans only. See details. ***Included with “Group Meal Plan” only. See details. 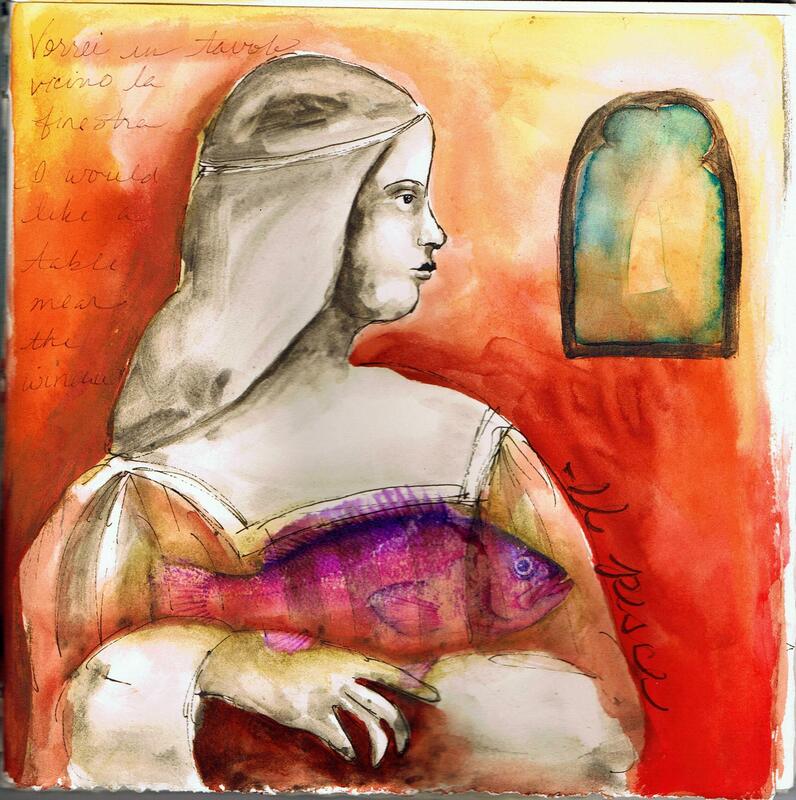 Registration is now open for Artful Gathering! This is the perfect way to attend an art retreat, featuring an amazing list of teachers from all over and the best part is you don’t need to pack your suitcase! Through out this very special event, there will be ongoing drawings for prizes, amazing workshops covering a variety of media and techniques. All instructors will be available for student’s questions and commentary from July 16 to August 27, at which time our event will close, and the final Grand Prize Giveaways will be Raffled. So pop on over and see what all the hubbub is all about! After receiving numerous requests, I’m excited to bring back my first online workshop for one last time! 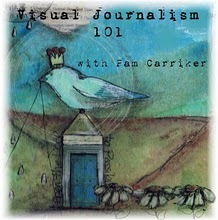 Visual Journaling is everywhere now but it can be intimidating to get started. 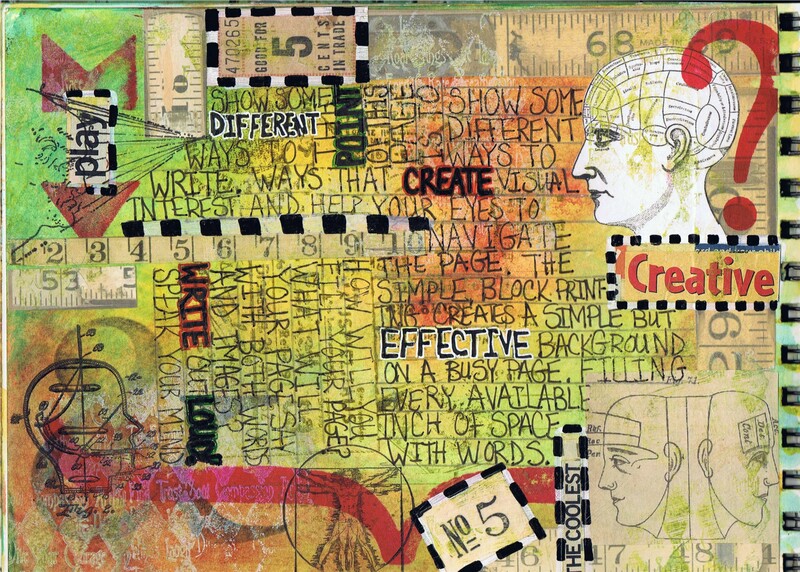 This workshop guides you through 5 lessons to create awesome pages using a variety of mixed media techniques that can also be applied to your other work. With an updated 29 paged down-loadable workbook, and a DVD of all of the video lessons (DVD’s will start to be mailed in August), you will be able to take notes and refer back to the lessons long after the workshop has ended. Almost 300 people have gone through this workshop, several have even had their journal pages published, so don’t miss out on this one last chance to begin Art Journaling today! I hope you will join us for a fun few weeks of creative inspiration!